← Could Your Immune System Use Some Support? 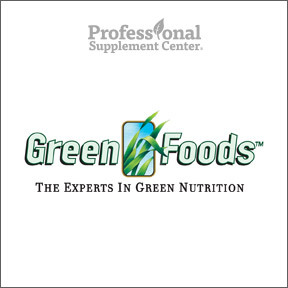 Professional Supplement Center is pleased to announce the addition of Green Foods™, a line of nutritious, balanced, green food powdered formulas. Founded by pharmacological researcher Dr. Yoshihide Hagiwara in 1979, Green Foods™ offers synergistic nutrients found in fresh grasses, fruits, vegetables, herbs and other nutrient-rich whole foods, processed to maintain the delicate beneficial nutrients. After developing over 200 highly successful products for his own pharmaceutical company and suffering from his own health issues, Dr. Hagiwara turned to a natural, nutritional approach to health, and has devoted his life to developing the best natural products available. His research of more than 150 plant species, led him to the discovery of young green barley as “one of the most nutritionally balanced foods in nature.” Published studies have found that barley grass supports cardiovascular function, helps to lower LDL oxidation and free radical activity, and supports normal levels of cholesterol. Green Magma® – Backed by over 40 years of research, this organic barley grass juice extract provides vitamins, minerals, amino acids, enzymes, chlorophyll, carotenoids, flavonoids and other valuable phytochemicals in support of whole body health and wellness. Nutrient dense, highly absorbable, mildly alkaline, and grown in the USA without pesticides or chemical fertilizers. Soy, wheat and yeast free, Non-GMO, organic vegan powdered formula. Matcha Green Tea – Organically grown and hand-picked in its native Japan, this ceremonial grade matcha is specially hand cultivated and ground on a stone mill, contributing to a mild and smooth taste, soft texture and mild flavor. This exceptionally potent, high ORAC value tea, provides strong antioxidant protection and powerful immune support. The high concentration of amino acid L-theanine contributes to relaxation, reduced stress and improved cognition. Gluten, soy and yeast free, 100% organic vegan formulation. Wheat Grass Shots – This 100% certified organic pure wheat grass juice powder provides the benefits of freshly squeezed wheat grass in a convenient and easy to use form. Gentle juicing and spray drying under low temperatures maintains critical active enzymes and provides high concentrations of chlorophyll in a tasty, smooth, non-gritty, highly absorbable drink. Wheat grass provides vitamins, minerals and enzymes to support digestion, energy production and detoxification. No additional ingredients. Gluten, soy, and yeast free, Non-GMO vegan formula. Barley Cat® – Cats naturally love to eat fresh green grass but they may also ingest harmful chemicals and pesticides that can cause irritation or stomach upset. Barley Cat® sprinkled on your pet’s food provides all the benefits of green food, specially formulated with poultry liver for a flavor enticing boost. Barley Grass juice powder provides active enzymes, vitamins C and E, beta-carotene, amino acids, chlorophylls, bioflavonoids and essential trace minerals. Regular intake promotes healthy skin and coat, improves digestion, reduces bad breath and restores energy, especially in senior pets. Barley Dog® – Studies have shown that eating grass is a normal behavior of domestic dogs. Barley Dog® provides green food for your pet without the worry of chemicals or pesticides. Sprinkle a teaspoon on your pets’ food to get the daily benefits of healthy skin and coat, improved digestion, reduced bad breath and restored energy, especially in senior pets. Similar to the Barley Cat® formula, but with a hickory smoked bacon flavor that dogs love. Low heat processed to retain nutritional value. Vegan formula. This entry was posted in Home and tagged Barley Cat, Barley Dog, Featured Brand – Green Foods, Green Foods, Green Magma, Matcha Green Tea, Professional Supplement Center, Vitamins and supplements, Wheat Grass Shots, www.professionalsupplementcenter.com. Bookmark the permalink.